The piece is a landscape of digital drones and textures, snaking their way in and out of existence, sometimes distant and sometimes right up close. Waves of ambiences seem to drop in from various physical angles, creating a 360 degree passage of sound. The shape of the piece is an arc, as we reach a point of intensity where we are completely grounded in the textures before we drop back down to a distant twinkle. The record is accompanied with two remixes by Pete Swanson (of Yellow Swans) and Ben Chisholm (producer of Chelsea Wolfe). Swanson presents a far more assaulting interpretation of the piece; aggressive and heavy, it is certainly a contrast from Chisholm’s, who found more consonance and almost some melody within his interpretation. We had a chance to ask some questions about his process and the music for The Celestial Din, which continues below the album stream. How would you say your visual art relates to your sonic art? Do they go hand in hand? The aural and visual creations, in my mind, are of the same expression. They each cross paths within me and tumble out as either or. There are times that I draw something, only because I cannot find a better way to express it and I need to get it into this realm. I have often wondered about the mediums we choose to employ and how we come to use each device. There is no doubt, that different forms of media are better suited for specific messages. But in my case I don’t view one without considering the other. At different times, each medium can fulfill different roles but are always beating with the same heart. A major divergence for me would be my design and illustration work. That work does not relate to my sonic creations. It relates to other individuals audio creations though; by way of the artists and composers I chose to listen to when I am drawing for clients or for myself. What is the Celestial Din? I created the term the Celestial Din to define a new (to me at least) sonic approach that was I interested in working with, one that dealt with both the universe within me and the one that surrounds me. I was looking for something to describe the tones and melodies that would be the foundation for a new set of atmospheres I had been feeling. The Celestial Din exhibition at the Hedreen Gallery allowed me the time and support to create that foundation. This term, in my mind, speaks to an ambience or resonance that gives the individual the space and time to approach an instant where attentive listening and its benefits are capable, but not just one moment, a sea of tranquility, reflection, and personal depth fostered by very specific and determined sound sculpting. I have spent many years creating music or soundscapes that were reflections of anxiety, pain, and depression, The Celestial Din as an ever blossoming concept, it’s my attempt at fostering a different option or course, for myself and my community. Do you have scores/compositions for your pieces? Is it improvised at all? Often times I create visual scores that map out my sonic ideas. These timbre diagrams notate the major tonal shifts of the piece, the color of the effects (emotionally speaking) and where the percussive elements should happen. I use these drawings to document and achieve composition. Just the other day I had to refer to the score/ drawing from the Celestial Din exhibit. I had forgotten how a major element of the piece was supposed to unfold. I was preparing for my upcoming performance, which is a celebration for the vinyl release of the Music For The Celestial Din. I had to sit down and look at the drawing again. It has been a full year since I have performed that work live and some of it was cloudy. That being said, the works are composed, but with moments of intentional openness, placed so I may react to the room I am performing in, my current state, and how I feel the audience is reacting or interacting with the work and with me. I don’t want everything to always be so concrete. With this type of music, there is a certain limit to that sort of approach. The recorded material captures and maintains the piece, but from a live standpoint, I am interested in the open processing of current emotional states, whether that’s from the player, the audience or the gear. There are those times when a certain synth just won’t get to the place I want it to be in, I don’t linger on that because that’s for this or that part, I shift, react, and move on. It works both ways too, because there are those times, in certain spaces, that the synthesizer will sing, it sounds like a full choir, teaming with angels. I want to run with that, let it happen and improvise within it. Can you describe the installation that went along with this piece? How is it different as a stand alone piece rather than with the installation? The installation consisted of five paper sculptures that had a speaker in the wood base. The sculptures were on casters and each of the paper sculptures were modeled after one of the platonic solids. The five channel sound piece was a slow moving minimal composition that I developed into the Celestial Din record. The paper sculptures on their own are fun 150watt two way house speakers. I’ve used them in my studio and in my home as normal listening devices, not ideal for me, but others maybe able to facilitate a fragile 27” W x 35” H paper tetrahedron or dodecahedron speaker for their living room. As cohesive piece, with all five sculptures and the audio, you get an active half hour piece that moves all around you, gently and with care. The pieces was set up in a large pentacle shape, the individual sat or stood in the middle and experienced the tones moving through them, swirling around and exiting. I wanted to create an environment that would induce sonic meditation and possibly give a glimpse that could sweep us away from the current physical state. Can you talk about the research in tunings and human responses to specific frequencies that you’ve talked about in regards to this piece? It began with my interests in alternative tunings for my analog synthesizer. I began learning about Pythagorean Tuning and the temperament it exhibits in a polyphonic situation. After a couple of years of research, testing, and experimentation, it became clear to me that there was something there and something of worth. There is a large amount of reported research on the topic, some of it false, some of it very abstract and some of totally worthwhile. I can only speak from my direct experiences and while I am still investigating these human responses, it has been worthwhile on multiple levels for my development as an artist. It’s a wild experience, when you play certain frequencies that are reported to do certain things, you play these tones to a room full of individuals who are unaware of what frequencies you are using and what they are supposed to do. What do you do when the majority of them have the same or similar experience? How can music become multi-sensory? I believe that certain types of music are already a multi-sensory experience. If you were only hearing just an uninvolved and singular notion, you would be missing a significant part of the interaction. I am most interested in music as a multi- sensory medium. Engaging work should speak to all the senses and inform them on multiple platforms. Whether that’s teaching the individual about their own physicality with amplified tone or that very same technique, but with acoustic treatments. Or you can redefine an architectural space with proper and present frequency control. These are experiences that I am after. We are a multifaceted culture, who for better or worse is no longer in need of a one-dimensional interaction. 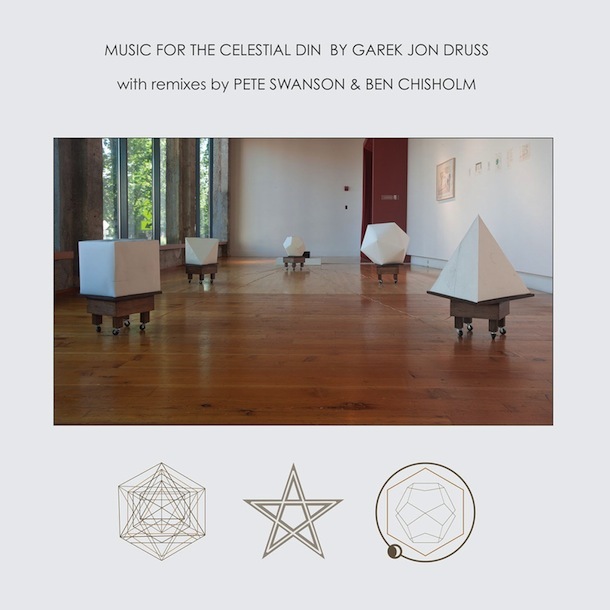 Garek Jon Druss’ Music For The Celestial Din is available for pre-order now, the physical is out September 30 and the digital to follow on October 7 on Debacle Records.